After celebrating Khalil Gibran’s 125th anniversary last month, Google has turned its gaze on a poet Gibran greatly admired: Palestinian May Ziadeh. Ziadeh was born in Nazareth on February 11, 1886. 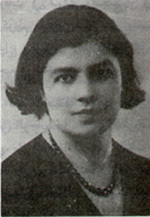 Ziadeh was an important literary figure both in the Levant and in Egypt, where she immigrated with her family in 1908. She was a prolific poet, translator, short-story writer, essayist, letter-writer, and critic, as well as host to an important literary salon. While her first collection of poetry (Fleurs de Rêve, 1911) was in French, she devoted most of her time and energy to writing in Arabic. Ziadeh’s poetry and essays were pioneering. She wrote numerous editorials and, in the words of scholar Antje Ziegler, “courageously took a stand against European colonial politics and defended the freedom of the press and other basic democratic rights.” But she was perhaps best-known for hosting a Tuesday salon, visited and admired by the young Taha Hussein, among others. 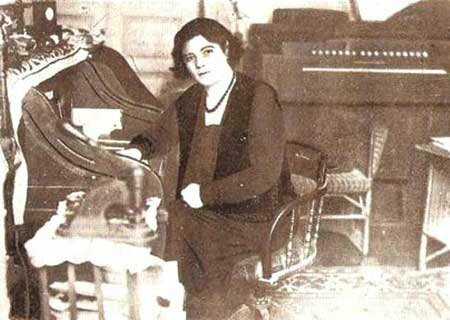 Numerous biographical studies of May Ziadeh have appeared in Arabic during the past five decades, and the steady flow of articles in Arabic journals and newspapers suggest the impression that Arab authors continuously feel tempted to interpret the contrasts in her life — her rise and fall from the heights of celebrity to the depths of supposed madness and complete isolation. …Ziyada’s admirably level-headed sensibility, the depth and breadth of the sympathy she displays for her subjects and her consistently articulate tone all render the historical gap ultimately negligible. When she fell into a temporary depression around 1935, her relatives had her legally declared incompetent and committed her to a hospital for mental diseases in Beirut. A handful of remaining friends, one of them the famous mahjar literate Amin al-Rihani, finally obtained her release with the help of a press campaign in leading Lebanese journals like al-Makshuf. But, even during the last years of her life, Ziadeh continued to write. Her work is not, to my knowledge, available in English. This is the most interesting and amazing blog about Arab literature(in English) written by interesting Lady.I am honored to read about Miss May Ziadeh.Thanks for writing. Each time when I come here I know I am going to enjoy reading Your amazing blog.Today I am thrilled..Theme is so brilliant,there is so little I knew about Miss.Ziadeh.Thank You for sharing Your knowledge with us,thank You for writing here at WordPress. thank you for this very informative post! It was a good read for me! I like the todays doodle, too. So I’ve created a short video with some facts on May Ziade. If you like it, feel free to embed it in your article, I think it will be a good ressource for your readers, too. I saw! You predicted it. hehe actually Rougeatre.wordpress.com did 🙂 i rebloged her lovely doodle. my doodle inculded Lenin, Assi Rahbani & Mehdi Amel .